Hardening of steels requires that the material be heated treated at a high temperature followed by a quenching and tempering process. The goal of the heat treating process is to develop the desired microstructure containing the phases offering the best combination of desired properties. During the heating cycle, the room temperature body-centered cubic Ferrite phase is transformed into the face-centered cubic structure known as Austenite. By quenching from the heat treatment temperature, the Austenite will then transform into the metastable phase Martensite, which is a very hard, but brittle phase. While the high hardness can be favorable for applications like cutting and tooling, Martensitic steels can be so brittle that they have limited use. Thus, a tempering process is almost always undertaken to reduce the brittleness of the steel at the expense of a slight loss in hardness. However, because of compositional and kinetic effects, the quench and heat treatment process does not always go to completion, and Austenite can be retained after quenching and tempering, which can lead to a degradation in the material’s performance. This is due to the fact that the retained Austenite can be transformed into fresh, untempered Martensite by applied stresses while in use. This transformation is accompanied by a volume change and subsequently increases the internal stress in the part and can lead to cracking problems. Since Austenite has a different crystal structure from Martensite and the other forms of steel (Ferrite, Bainite and Pearlite), the resulting diffraction pattern will also be different. Thus, we can estimate the amount of Retained Austenite by comparing the intensities of diffraction peaks arising from each of the phases. In the absence of significant undissolved carbides and preferred orientation, there is a good correlation between the intensity ratio and the volume fraction of retained Austenite. 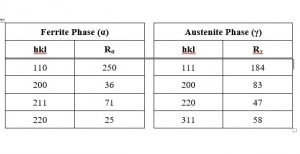 R1, R2 = Correction factors for Austenite and Ferrite, respectively. 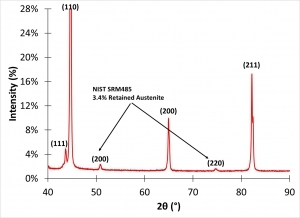 Two problem areas are likely to come up when doing retained Austenite analysis. The first arises when a significant amount of undissolved carbides is present, while the second occurs when either the Austenite or the Martensite has a preferred orientation. In general, both problems are difficult to solve using conventional methods, such as those outlined in the ASTM and SAE standards. To overcome these problems, the preferred way today is to use the Rietveld whole pattern method whereby the entire diffraction pattern is analyzed instead of just the three peaks shown in Figure 1. The Rietveld refinement is a fundamental parameters method in which the diffraction patterns from each phase (with or without texture) is modeled and scaled to provide a least squares fit to the observed diffraction pattern. With the simplified method where there are no carbides or preferred orientation, the ASTM/SAE methods can be accurate to levels as good as 1% with a sensitivity level of about 0.5%. In the more complicated cases where the Rietveld method is required, similar results can be expected, even in the presence of carbides and texture. Figure 1. Diffraction pattern used for retained Austenite analysis.